A Colombian drug trafficker testified Tuesday that Mexican cartel leader Joaquin "El Chapo" Guzman boasted about paying a $100 million bribe to the former president of Mexico to call off a manhunt for the notorious kingpin. 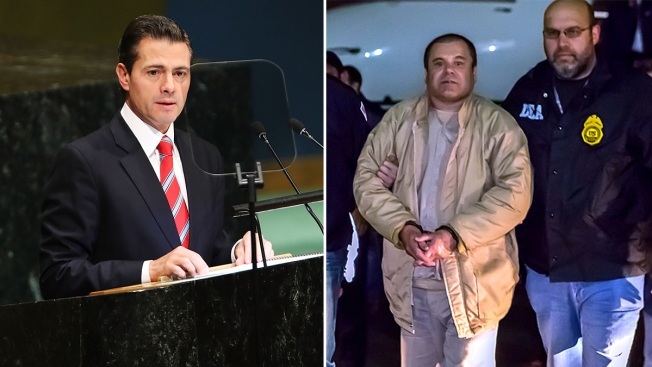 Alex Cifuentes spoke about the alleged bribe to former President Enrique Pena Nieto while being cross-examined at Guzman's murder and drug conspiracy trial in New York. A spokesman for Pena Nieto, who left office last year, called the bribery claim "false and defamatory" when it first came up earlier in the trial. Pena Nieto was still president when Guzman was captured in 2016 and extradited to the U.S. in 2017. Attempts to contact Pena Nieto and his representatives were unsuccessful Tuesday. Cifuentes acknowledged that he first spoke with prosecutors about the bribery allegation when he began cooperating with U.S. authorities in 2016. After expressing confusion about the details, he acknowledged that he had told prosecutors that he was informed by Guzman that someone named "Comadre Maria" delivered money in Mexico City in October 2012, at a point when Pena Nieto had been elected president but before he took office. "By 2018, suddenly the numbers became fuzzy?" Lichtman asked. "Yes, sir," the witness responded. Guzman is on trial in New York on charges that could put him in a U.S. prison for the rest of his life. The trial has featured numerous allegations of bribes or attempts to bribe high-level officials in Mexico and Columbia, including police commanders and other officials in charge of fighting the drug cartels. The judge in the case, U.S. District Judge Brian Cogan, admonished Lichtman after his opening statement to the jury, saying some of it included "inadmissible hearsay" about corruption. "Your opening statement handed out a promissory note that your case is not going to cash," the judge said at the time.